I made it through my first day of no caffeine but if I had known how difficult it was going to be I might have thought twice about it. I felt like my head weighed 1000 pounds and at one point I thought I was going to toss my cookies. It is really alarming to realize how dependent my body is on caffeine so I’m going to try my best to stay away from it for the next 30 days. The one thing I am struggling with is what to replace it with. You see it’s not coffee that I have a problem with, it’s Diet Dr Pepper. I have been drinking diet sodas since I was 10 years old and I know that I am going to miss it terribly, much more than cookies, candy and ice cream. I’m just going to take it one day at a time and try to retrain my palate as much as possible. So in that spirit I thought I would share seven of my favorite smoothie recipes with you in the coming week. 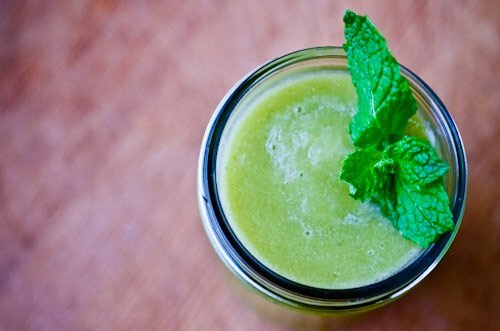 I’m finding that I love to have a smoothie first thing in the morning, it comes together quickly, is low in calories and a great way to get you to your recommended five servings of fruit and vegetables a day. 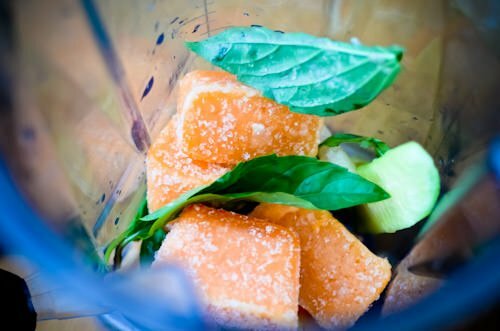 This cantaloupe smoothie is sweet and refreshing, I was lucky enough to freeze some beautiful melon that I picked up this summer so I just throw a few frozen cubes into the blender. Hope you enjoy it! Sounds great! But where are the rest of the 7 smoothies? I can’t wait to try some of these. I realize this post is from a couple years ago but I am curious how you are doing with not being dependent on caffeine and Diet Dr. Pepper. I ask because I myself am trying to ween (not sure if that is spelled correctly) off of caffeine from coffee. I am also curious how/if you kicked the Diet Dr. Pepper habit because I have a co-worker who is addicted to regular Dr. Pepper, but has to get himself un-addicted due to some health issues. I have to say that I never would have managed to kick the habit without juicing. As much as I like to think that I can be happy drinking plain water all day that’s not the case. I have learned that I do like flavored water. I add cucumber and lime or strawberries and basil to a huge pitcher of water and it keeps me pretty happy. It wasn’t easy to kick the habit, I had a week or two of being pretty miserable but after that it was surprisingly easy. My biggest advice is to taper slowly, work yourself down to one caffeinated beverage a day and stay there for a few days before you try to give it up completely. Having some good alternatives are important so find something else that satisfies you. Good luck with the process and be patient with yourself, if you need one then have one and try again tomorrow!